High-grade robust brass bulkhead fitting. Ideal to create an optically appealing and functionally matured connection between inside of the case and an external cooling loop. With the two included counter-nuts the bulkhead fitting can be fixated safely. Only a suitable hole must be drilled. Then simply insert the fitting and fixate it with the counter nuts - done! 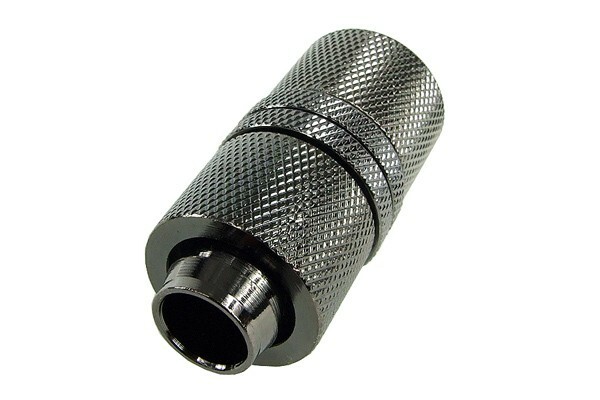 This fitting can also be used to easily connect a separated piece of tubing: Simply connect each end to one of the compression fittings and fixate the tubing. Das haben Sie genau richtig verstanden. Diese Schottverschraubungen sind dazu da um den Schlauch aus dem Gehäuse zu führen.